Remember the demise of my first USB table fan? Remember I got a replacement on the cheap? Well, here's the thing. The cheapo replacement lasted one week (well, 4 working days to be exact) before it died. The motor couldn't take the abuse of 8 hours, 4 days straight. So anyway, I decided to spend a little more and get a more decent fan. 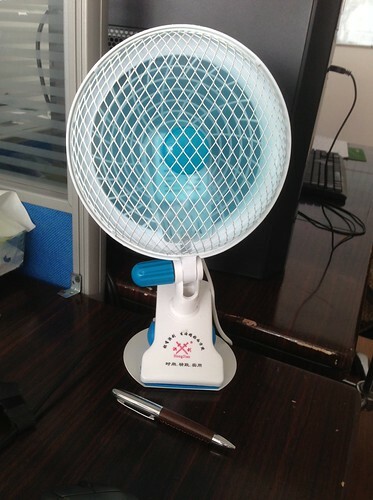 Table Fan III for a princely sum of RMB 34.00 (SGD 6.80), including shipping. I put a pen in the photo to give you a gauge of the size of this little fan. Only difference is that it is not USB powered. It's a full fledged 220V AC plugged-in fan. Originally, I wanted to kiap kiap the fan to my cubicle partition but realised the base (also the clamp) is heavy enough on it's own. My new table fan which I hope can last until autumn.